During the normal operation of a cold store, pressure differences can form between the store and outside. This can make doors hard to open and, if left unchecked, even damage the structure of the store. To allow pressure to equalise quickly and without a drop in temperature, a pressure equalisation valve should be installed. The Thermatek® pressure equalisation valve has a large aperture to allow air to pass freely when needed, protected by stainless steel flaps which close off when pressures are equalised. 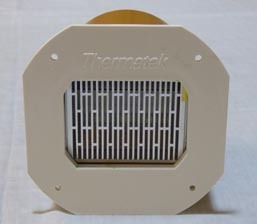 The interior of the unit is heated by low voltage heating elements to ensure the flaps can move and air continues flowing even at low operating temperatures. The unit is made solely of plastics, aluminium and stainless steel, so there is never any risk of rust or flaking paint. The Thermatek pressure equalisation valve is available as a standard size (for walls 75-100mm thick) or extended (for walls over 100mm). To discuss your requirements or place an order, please contact us.